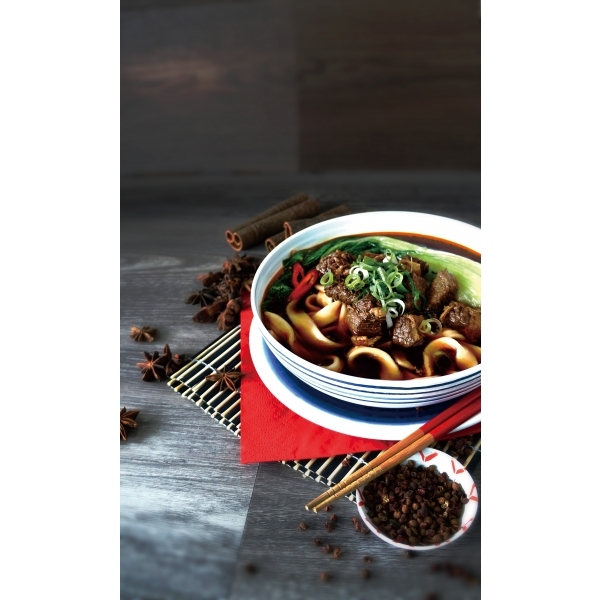 Classic beef noodle soup - Products - HAN DIAN (UK)LTD.
Water, beef (32%), soy sauce (water, sucrose, soybean, wheat, salt, alcohol, yeast extract), beef bone, radish, carrot, onion, spicy soybean sauce ( red chili pepper, soybean, water, broad bean, salt, sugar, sesame oil, soybean oil, wheat flour, Flavour enhancer: E631, E627, xanthan gum, star anise powder), hot broad bean paste (chilli, broad bean, salt, canola oil, wheat flour, Flavour enhancer: E621, sugar, Acid: E330), ginger, green spring onion, chilli black bean sauce (soybean oil, black beans, soybean, salt, chilli, salt, sugar, sichuan pepper, Flavour enhancer: E621), rice wine(water, rice, refined edible alcohol), sugar, garlic, tomato paste, Flavour enhancer (maltodextrin, salt, sucrose, yeast extract, hydrated soy protein, mushroom extract, cabbage extract), salt, star anise, cassia, sichuan pepper, licorice. For allergens including cereals containing gluten see ingredients list in bold. Store in the freezer at -18°c or cooler. Do not refreeze defrosted product.